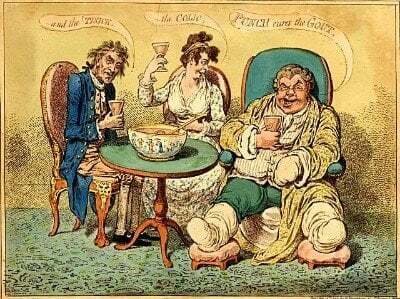 Which Gout Treatments for Uric Acid Control? Which Gout Treatments for Uric Acid Control is part of the 4th step in your gout treatment plan. Now, you choose the gout treatments you will use to lower uric acid. Please note that this is part of my 2016 Gout Treatment Plan. But since that time, I have started to develop new plans that differentiate between drugs, herbs, and diet treatments. Because it is easier to first decide which type of gout sufferer you are. Then you can focus on the types of uric acid control that suit you. In Step 2, you decided that Chronic Gout Treatment is most important to you, at the moment. In the previous step, you chose Medical or Natural Gout Treatment. If you haven’t made those choices yet, please go back to Starting Gout Treatment Guidelines. In this step, we first need to recognize the 4 phases of uric acid control. Then, you need to set target uric acid levels. It’s best to set targets before you start. Otherwise, set uric acid targets during the next phase. If you use pharmaceutical gout treatments, the preferred option is usually allopurinol. Allopurinol belongs to a family of gout medications that limit uric acid production. For allopurinol, the only preparation is for people of Han Chinese, Thai, and Korean ancestry. People in these ethnic groups require a specific genetic screening test. Your doctor should arrange an allopurinol screening test if you need one. A newer alternative to allopurinol is febuxostat. This is supplied under various brands. Brands include Uloric, Adenuric, and Feburic. Gout patients taking febuxostat should check with their doctor regarding effects on liver function. Some gout sufferers are under-excreters of uric acid. This might have been tested during your gout diagnosis. If not, you could ask to be tested now. Under-excreters have additional treatment choices of uricosuric drugs. For natural gout treatment, it is particularly important to know if you are an under-excreter or over-producer. People avoiding pharmaceutical treatment might also consider blood donation or acupuncture. There is also a chance that some natural products promote uric acid excretion through the gut. Natural gout treatments have less research. Therefore, you have to be prepared to conduct your own experiments. Titration is when you start with universally safe doses of your chosen treatment. Then, following blood tests, doses can be increased. You increase the dose until you reach your target uric acid level. In rare cases, you might get adverse kidney function or liver function test results before you reach safe uric acid levels. If that happens, you will need to change your gout medication. Most uric acid lowering treatments can be combined as a package. Often, a uric acid medication package will allow you to reach safe targets. Every gout sufferer needs their own gout medication package. Your prescription, or herbal ingredients vary according to your test results and personal preferences. Your health adviser will recommend appropriate doses of your preferred medications. You can get more help with personal uric acid treatment plans in my gout forum. The remaining 2 phases of uric acid control are debulking, and maintenance. I cover these in the remaining steps in your gout treatment plan. Chronic or Acute Gout Treatment? Medical or Natural Gout Treatment? a) Which Gout Treatments for Pain Control? 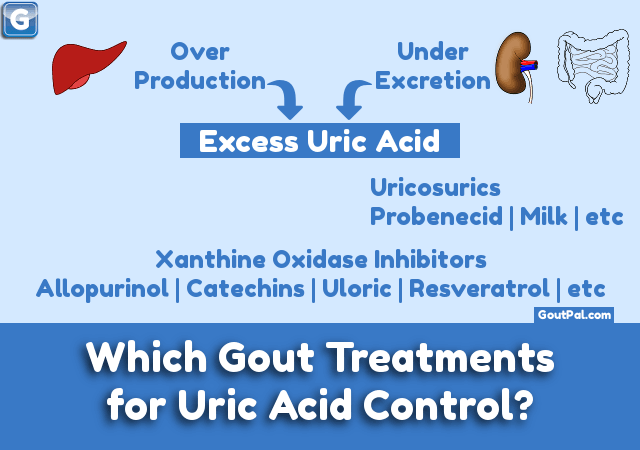 b) Which Gout Treatments for Uric Acid Control? Leave Which Gout Treatments for Uric Acid Control to browse my Gout Treatment Guidelines. TL;DR - Which Gout Treatments for Uric Acid Control?